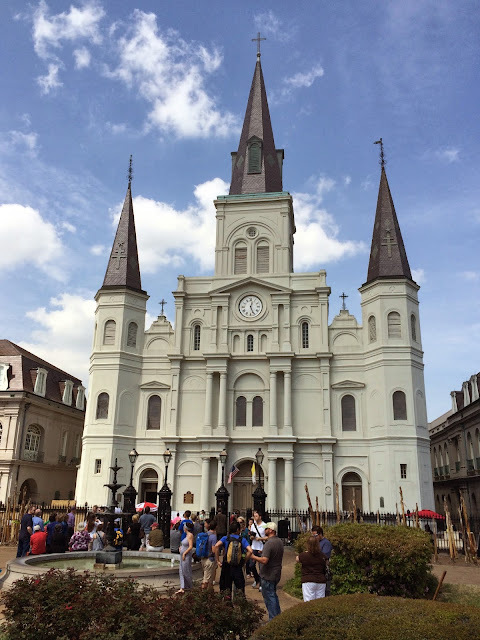 Up early, Sharon and I went to the 9:00 am Mass at the St. Louis Cathedral. This is the oldest active Cathedral in the United States (since 1718). 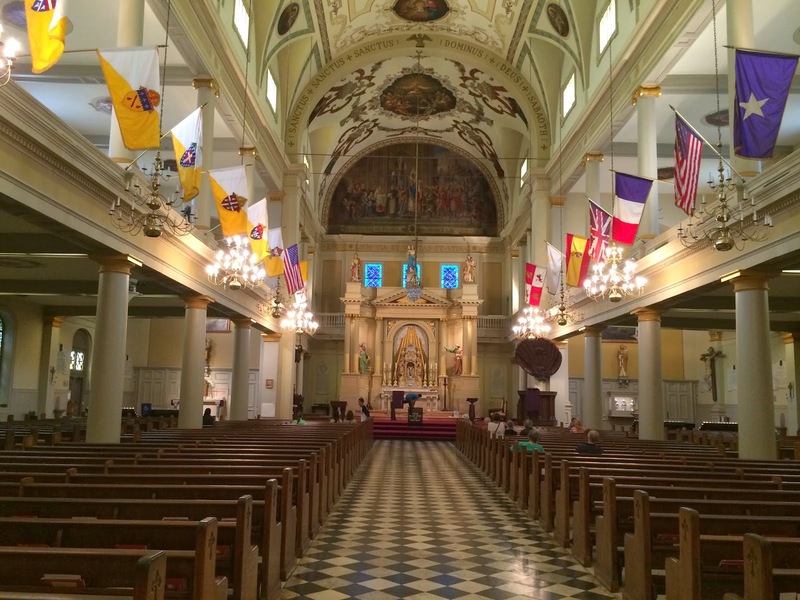 The Mass was packed. I would guess that there was more than 1,100 people. After the Mass and a quick stop for Sharon to do some shopping, we met up with Janie and the Gainsleys in the lobby of the hotel. We had two destinations for the day: the Garden District and the National World War II Museum. We caught the St. Charles [green line] trolley to the Garden District. While French Quarter was initially established by Creoles during the French and Spanish colonial periods, the Garden District was created by Americans after the 1803 Louisiana Purchase. We took a Fodor's walking tour for about an hour that spotlighted almost two dozen mansions with a variety of interesting styles. We finished the walk with a drink at the Commander's Palace. We then got back on the trolley. We jumped off near The National World War II Museum. Our schedule got a little blown up at this point. We hadn't eaten. We put our names in for the American Sector Restaurant, but it took a lot longer to get a table than we expected. I had a chance to walk through the museum, but not spend as much time as I probably should have in the galleries of the Louisiana Memorial Pavilion. We watched the 4 pm showing of Beyond All Boundaries. Narrated by Tom Hanks, this film is billed as 4D journey through the war. We finished the evening with a late dinner at the Bourbon House Restaurant. While we waited for the table, I sat at the oyster bar and finally got a chance to enjoy some oysters. Both Kevin and I had a combination fried seafood platter.